In my life thus far, becoming a dad has pretty much represented the pinnacle of my existence. And I'm pretty sure there's nothing I can do from this point on to top it. I've carved the beginnings of another generation of person (hopefully people by the time all is said and done) to take what I've brought to the table, improve upon it in their own way and do something grand. In other words, I deserve a break. And that's just what I got last weekend (as in more than a week ago, as opposed to yesterday, because I never update this blog anymore. Sorry...), thanks to a most excellent Christmas present from d wife. I got to spend one weekend, by myself, in San Francisco and drink all the fine Scotch I could handle for an entire evening at the Whiskies of the World Expo. Yup, the good stuff. Yup, as much as I wanted. Yup, I'm now inclined to believe that Santa and the Tooth Fairy also exist. For two days I got to shed my dad hat, and swap it out for something a little on the dusty side but still salvageable after almost 7 years in the proverbial garage of all that is me: my classy dude hat. It's been a long time since I've done something to recharge the guy behind the guy behind the guy, so I was all too excited. So excited that I left my Blackberry on the roof of my car at the airport Park n Ride. Which brings me to my first note on being classy. "Sir, is that your Volvo?" said the man. "I think you left some--"
"OH MY GOD! Thankyouthankyouthankyouthankyou!!! My phone!!" "Thankyouthankyouthankyou... I can't live without my phone. I don't know what I would have done. Thank you. Really. Thank you so much." "That was so close. Thanks again." [Turns to his wife and kids] "See? They'll make you crazy. That's why I leave mine OFF on weekends." After our nightmare on United Airlines, I had pretty much lost all confidence in the flying biz. But wow, nice airlines do still exist. If you want to be classy, you need to feel classy first. And you don't need to shell out for first class to accomplish that. You don't even have to pay more than you would at United Airlines. Just fly an airline where you can buy a ticket and actually get a seat on that plane (I didn't say my standards were high, just realistic). So the nightclub-style cabin lighting, leather seats (in coach! nice touch), individual touchscreen TVs and flight attendants with British accents helped too. A little wee bit. Don't Yell. At Your GPS. Like I do. The GPS on my Blackberry is either really stupid, or likes to amuse itself at my expense. This is the GPS that sends me off an exit to re-route around traffic, then sends me right back onto the freeway. Then off again at the next exit, then back on. Then off. Then on. For five exits. So I was kind of hesitant to use it when I got off the BART (SF's subway system) at Embarcadero station because the hotel I was staying at was only three blocks from the station, according to its website, and I figured simply wandering around would do the trick. As generations of men have discovered and re-discovered, wandering around isn't really an effective navigation strategy, so I eventually I resorted to firing up the ol' GPS. With luggage in tow, a laptop bag and far too many layers of clothing on for this unusually warm San Francisco Saturday, my journey began. Turn right here, turn left there, go straight 500 feet, turn left here, "recalculating route" (what? why?? I followed your damn directions to the T!) go straight, turn left... for a good 15 minutes, I faithfully followed every instruction my GPS barked at me. And eventually we made it. Right back to the exact spot from which we started. If I wasn't dripping with sweat, chaffed from luggage straps and cursing the waste of taxpayer dollars we call satellites, it would have been quite amusing. But it wasn't like I was going to ask anyone for directions, right? So I punched in the address and started over. Off to a good start. I actually found the street it told me to find. Go straight? Yes, I can handle that as well. "You are not on a street." Amidst this conversation I was enjoying with my GPS, I happened to catch a glimpse of a street sign. Not anything that my GPS was asking me to find, but an important one all the same. The street that the hotel was on: Battery St.
"Ok, GPS, I'm giving you one more chance. At least let me know which direction on Battery I need to go." "Turn left. On Clay St."
I eventually found it. This picture on the right is the GPS, still recalculating. "Really? Thank you, I wasn't sure if I was intruding on someone else's hotel shower." If you do what it takes to take care of what you've got to take care of, then allow yourself to indulge in what makes you happy every once in a while. In my case, it's a fine distilled spirit. Saturday's Whiskies of the World Expo was one of those evenings you just can't forget, unless you sampled over 20 different Scotches, bourbons, rums, vodkas and gins. In which case you're glad that you brought your camera, and can piece together your Twitter updates to figure out what Scotch to buy the next time you hit BevMo. 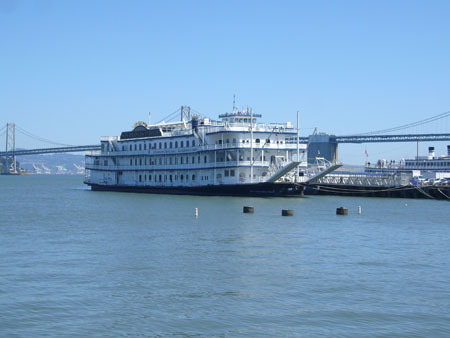 The event was held on the San Francisco Belle, a really big boat. It was docked, but you could still feel it rocking on the water. But I guess after a few drams, who can tell the difference? All three floors of the boat were reserved for this event. The first floor was the food. I shared a table with two other guys who told me I had to "check out the 31 yr. old" on the top floor. Not totally in Scotch drinking mode yet, I must admit the first thing that popped in my head wasn't a bottle of alcohol. But it kicked in a second later (before I said something stupid) and off I went. I went straight to the Tomintoul table on the third floor. The 31 yr. old Reserve is the first drink that touched my lips that night, and the last thing that left my mind. It was one of those rare Scotch moments where you recall it more as breathing it in than drinking it. And when you have these guys marching by you during all of this, well damn, you can almost feel the breeze over the glen, kicking up your kilt. Then the guy tells you that this bottle retails for $450. And you realize that this is not going to be your daily drinker. In fact, you better have another sample and remember it well. Cause you ain't ever drinking it again. (By the way, the Tomintoul 16 yr. old retails for around $50 and is excellent - my recommendation if you want a nice, sweet-ish, not-too-peaty, smooth Scotch). Since they won my "Best in Show" award, even after a night of sampling the best the world has to offer for getting your buzz on, I returned to their table at the end of the night and said to them "can I take a picture with you for my blog?" Ok, so they stink up a room, and linger for days. But something that's still made pretty much the same way it was generations ago, and whose individual character reflects the artist who nurtured its leaves and the craftsman who rolled it, is classy. In an old school, guy's guy kind of way. And no one will ever change my mind about that. I don't have a great record with this, but I'm trying. So the next morning, as I am strolling along the Embarcadero, I have a random conversation with myself. "Wouldn't it be funny if I ran into Veronica Belmont here? I mean she does live in San Francisco." "Yeah, good luck. You know how big this city is?" "Well I'm just saying, if I did it would be cool." "Ok, let's say you did. So what would you do, ask for her autograph?" "No, I'd ask her to follow me back on Twitter." Not an hour after this conversation, as I am walking back to my hotel, guess who I see walking my direction? She is with a male companion and looking like she's enjoying the conversation in which they are immersed. I refrain from my earlier plan of action and just keep walking (after a double take and near-trip). Cause I'm (chicken) classy like that (chicken). I know, I know. Classy is 90% attitude. But really, who doesn't want to hear "youu loook maaahvelous" every once in a while? That is why when the publishers of Esquire's Handbook of Style contacted me a few months back to review their book, I said "yes. please? please? like right now?" I love this book. It's one of those books that I will always keep within reach of my closet because it answers ALL the questions that men have about style. And it's done with simple charts, pictures, rules and lists. I don't like to read. I want my information in individual ready-to-eat servings. And this book delivers. Written for the everyday dude, the Handbook of Style uses profiles of style icons like Fred Astaire, Robert DeNiro, Andre 3000 and even Albert Einstein (rock the V-neck, baby!) to illustrate men's style themes, paradigms and trends, so that you not only know the how, but also the why. And the book is hilarious to boot. Example? The Denim Flow Chart. Are your jeans blue? No. Are they white? Yes. Are you George Michael? No. --> Take them off. Are they black? Yes. Are you Joey Ramone? No. --> Take them off. This is a picture of my copy (which usually lives on my nightstand, unless I'm trying to simultaneously shoot a classy picture of it and come up with an excuse to pour some of the "good stuff"). But if you would like your own copy, I've got one more. And I am giving it away. Just indicate in your comment that you would like to be entered in the drawing and I'll do the rest. Because I am nice. And nice is classy.